It’s no secret that US parks have some of the best hiking in the world. They represent our nation’s physical extremes. Denali, the tallest mountain in North America, towers 20,310 feet above sea level in Denali National Park and Preserve. In the lower 48, Sequoia National Park’s Mount Whitney is the tallest peak, measuring in at 14,505 feet at the summit. Just 85 miles away, Death Valley National Park contains North America’s lowest point: Badwater Basin, sitting 282 feet below sea level. In Kentucky, Mammoth Cave National Park lives up to its name as the home of the world’s longest known cave system, encompassing more than 400 miles of passage — about the distance between Chicago and Nashville — mapped so far. Also below the surface, the deepest lake in the US can be found at Crater Lake National Park, which reaches 1,943 feet or so at its deepest point. From summiting 14,000-foot peaks, to ducking down into deep canyons and walking peaceful riverside trails, the Centennial State has something for everybody. Here are some of the best trails in the country. Don’t pack warm clothing for this hike. In the summer, it is not uncommon for temperatures to hit 110 degrees Fahrenheit at the Grand Canyon, and temperatures are even more intense on the canyon floor. Add to that the intensity of climbing nearly 4,500 feet in nine-and-a-half miles, and it’s no wonder that so many people call for rescues. Start hiking before dawn to beat the heat of the day, and pace yourself on the ascent by resting for 15 minutes for every hour. Carry and drink lots of water. Starting at the Poudre Lake Trailhead, you’ll be above the tree-line for eight of the trail’s 10 miles. With hikers and peak baggers drawn to Colorado’s 14,000 foot peaks, it’s also likely that you’ll have much of the trail to yourself on your way to the 12,889-foot summit. It’s also recommended that you start your hike early to avoid the afternoon thunderstorms that can be common in the region during summer. Delicate Arch is the most popular site in Arches National Park, but don’t limit yourself. Devil’s Garden is a slightly primitive and lesser-traveled loop trail that follows quintessential southern Utah slickrock to not one, but a whopping eight arches in just seven miles. Summers here get unbearably hot, so try to visit in the spring or fall, and if you want to camp, make sure to book your site as far in advance as possible. The experience of hiking Bryce Canyon is visceral and humbling, and to consider the geological forces responsible for creating this unique place is an exercise of immense imagination. The park’s series of vast natural amphitheaters (they’re technically not “canyons,” despite the name) have been etched by erosion for millions of years. Small or not, the park can afford you days of on-foot exploration, and the varying levels of trail difficulty and length mean there’s something for everyone. Below are some recommended options; click here for a full list. Note that many of the trails are interconnected, so multiple route combinations exist depending how long and far you want to walk. Also, keep in mind that these hikes take you from the rim down into the amphitheaters — it’s always uphill on the way back! The terrain Chattahoochee National Recreation Area is characterized by rich deciduous forests threaded with creeks and wetlands draining to the Chattahoochee River. The Chattahoochee National Recreation Area has extensive trail systems along the river. North of the city, my favorite hiking trails are Gold Branch and Johnson Ferry North. Although it doesn’t show it on the map, the Johnson Ferry North trails connect with historic Hyde Farm, a family farm that continued in operation (subsistence farming) even as suburban sprawl consumed the surrounding area throughout the 70s, 80s, and 90s. If you don’t have time for the John Muir trail you can still summit Mt. Whitney since the peak is accessible via a walk-up trail. It’s preferable to do the 22-mile round trip over several days as a backpacking trip starting from the east at Whitney Portal, though extreme day hikers and those unable to secure permits attempt the day hike every day. The aforementioned Whitney Portal Store at the campground is well-stocked. If you are attempting the day hike, buy some ibuprofen, you’ll need it for the altitude headache. A trail cut into Angel’s Landing, a rock formation in Zion National Park, leads to a view of Zion Canyon. The path to the top includes 21 steep hairpin turns, known as Walter’s Wiggles, before arriving at Scout’s Lookout. The lookout is the last stop before the final trek to the top of Angel’s Landing. The final half mile, littered with narrow pathways, unevenly surfaced steps, and sharp cliff dropoffs, is equipped with chains to grip for safety. Fatalaties on the trail to Angel’s Landing have occurred, but the view and strenuous climb continues to attract hikers. Noland Divide TrailBryson City, United StatesLooking for a day hike in the Great Smoky Mountains National Park? Check out Lonesome Pine. This 6.7 mile (round trip) hike is on the more strenuous side but hikers are rewarded with solitude and breathtaking views. Wear comfortable shoes (and clothes). Drink plenty of water in advance. Bring more with you and a snack. Grab a map from a visitor center or download one on your phone. Clingman’s DomeGatlinburg, United StatesClingman’s Dome is the Highest point in the Great Smoky Mountains National Park and offers 360 degree views of the park from the observation deck. It’s easily accessible from both Cherokee/Bryson City, NC and Pigeon Forge, TN and the journey there takes you all through the park. In the Smoky Mountains it’s hard to predict but try to head up here on a clear day. Dress in layers because the elevation really cools things off up there. A classic hike in Yosemite which gets crowded in the summer for good reason. A permit is necessary for Half Dome so make sure to plan ahead if you intend to go that far. Consider doing this hike in spring as there will be less people and the snowmelt will create more mist. The trail is carved into rocks close to the plunging Merced River. As you ascend Yosemite’s unique glaciated geology spreads out around you. Stock up on snacks in Yosemite Village before heading off. 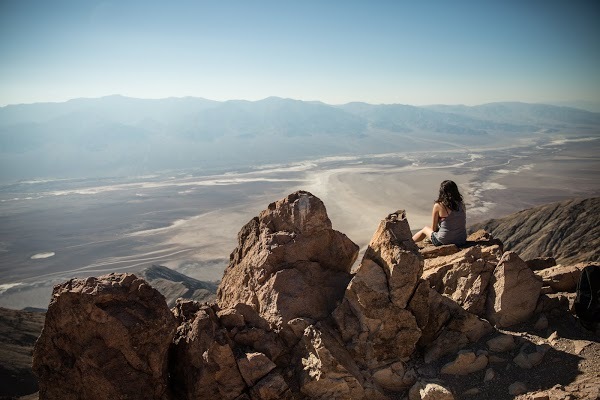 If you want to get the best view of Death Valley then you need to head over to Dante’s View, the highest point in Death Valley standing at 5,000 feet. It’s easy enough to get to Dante’s View by car and then take a 5-minute walk to the peak where you’ll spot salt pans down below and the banded canyons and rising mountains in the distance. Steamboat RockMoffat County, United StatesIt was well worth the drive out to #EchoPark Campground for the night. I had a slight issue getting out of the campground in the morning due to some rain but I made it. Note to self, take park services advice when they say the road is impassible when wet. The rock covers 600 acres and the trail that ascends from the base of the rock to the somewhat flat top affords hikers incredible views of the surrounding area after an initially steep ascent. This short, easy walk rewards with spectacular views of both Upper and Lower Yosemite Falls. This paved loop trail offers different vantage points of Yosemite Falls and Yosemite Creek. Little Lakes Valley to Gem Lakes is a 6.9 mile out and back trail located near Bishop, California. Covering roughly 1191 acres, glacially-carved Jenny Lake is the second largest lake in Grand Teton National Park. At 423 feet it’s also one of the deepest. Bechler River Trail has everything people come to Yellowstone Park for wildlife, waterfalls, hot springs, picturesque river canyons, and great fishing. It is also one of the least visited areas of the park. That said, don’t leave getting your backcountry permits until the last second. Camping is limited to established campsites and there aren’t many. It is also one of the least strenuous trails in the Rockies, being flat or a slight decline for most of its substantial length. It’s flat grade turns boggy in some areas, making it almost impassable until early August. Madison Junction CampgroundYellowstone National Park, United StatesCamping at Madison campground is the perfect location to discover bison right at your doorstep. Take a 1-minute walk to Madison River, perfect for photography opportunities for landscape and wildlife. The campground has flushable toilets and potable water. It’s a great location and perfect for families. Muir Woods is a short drive (12 miles) north from San Francisco and is a part of the Golden Gate National Recreation Area. This area has 6 miles of trails. There is a 1/2 hour loop, a 1 hour loop, and a 1 1/2 hour loop as well as longer hikes on trails that extend into surrounding Mount Tamalpais State Park. 14,411 foot-high Mount Rainier is visible from Seattle, but climbing it is no easy undertaking. It requires travel on the largest glacier in the Lower 48 and advanced technical knowledge. As the fifth-tallest mountain in the Lower 48, Rainer’s shadow has landscapes that include roaring rivers, vibrant meadows dotted with wildflowers, and jagged snow-capped peaks. Most hikers take nine or more days to complete the trail in its entirety, and the steep terrain suggests that training beforehand is wise. Still, there is probably no better place in America to get a “big mountain” experience with such a short approach. For more information on climbing Mount Rainier, try the National Park Service trail descriptions or the Summit Post.